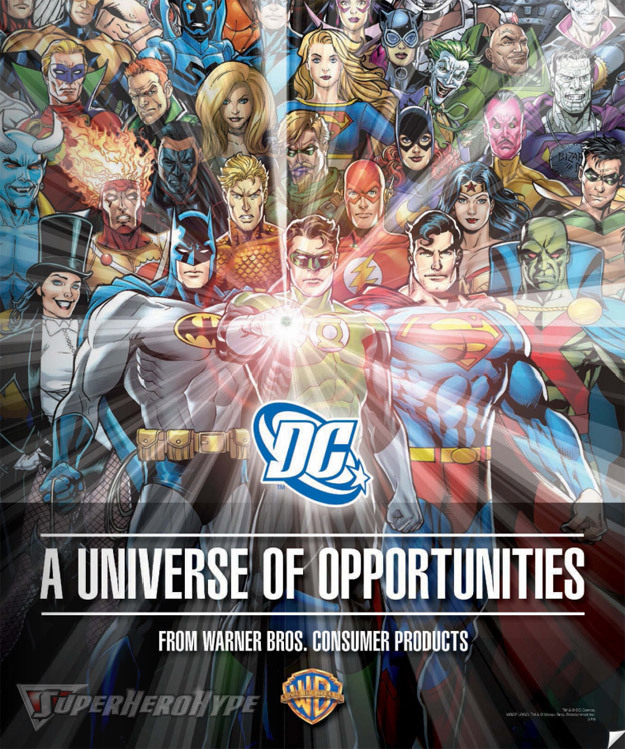 Blue Devil … on a Warner Bros. Consumer Products promotional poster? Seriously? Really? How friggin’ cool! The image below comes from License! Global which is gearing up for their big licensing show in Las Vegas next week. It was released along with some promo art for the upcoming Green Lantern film. Visit SuperHeroHype.com for further information. Click the image to enlarge. Believe it or not, it sort of makes sense they featured Blue Devil. Mattel just recently released an action figure of Blue Devil for their DC Universe Classics line. So I can rationalize his prominence in this piece especially since this is about merchandising. Interesting to note there are other characters besides Blue Devil appearing in their “classic” or “iconic” look, such as: Firestorm, Batgirl, and Martian Manhunter. Green Lantern (Hal Jordan) appears in his current costume (post-Green Lantern: Rebirth), but that sort of makes sense as DC is pushing him and banking on his future popularity created by the upcoming feature film. The oddball is Aquaman appearing in his Brightest Day costume. I guess since his costume change was so minor they didn’t have issue with using the new version. Total speculation on my part. The layout of characters is actually quite interesting from a marketing point of view. The primary focus of the image is Green Lantern, Batman, and Superman. This seems to suggest they are the new trinity for DC from a merchandising perspective. Sorry Wonder Woman, you’re stuck on the second row wedged behind Clark and J’Onn. Beyond the big three in the front row, the eye seems to travel in a triangle upwards to Aquaman, Flash, and Green Arrow. Those six characters form what I’ll call the “central pyramid” in this image. That seems logical given the amount of merchandise out there featuring the characters from the central pyramid. What is surprising is that Wonder Woman didn’t make it into the central pyramid, and that characters like Martian Manhunter and Zatanna share the front row. WTF? Are we celebrating Justice League Detroit here or something? And Firestorm, Blue Devil, and the Weather Wizard rate the second row? Really? Not Hawkman, Atom, Captain Marvel, or others? I can only hope this is foreshadowing to a major merchandising push for Blue Devil! That’s right folks, let’s celebrate the rising of our favorite Weirdness Magnet! Before you know it, Blue Devil will be on lunch boxes, spiral notebooks, puffy stickers, and silly bandz. … not. Oh well, a boy can dream. For those of you that read both ONCE UPON A GEEK and FIRESTORM FAN, sorry for some repeat information today. i think that the ‘central pyramid’ you speak of in this poster should Include Supergirl, or Superwoman or whoever she is…the chick in Superman garb. I think she ‘tops’ this pyramid what with her ‘bright’ blonde hair, the fact you see the “S” on her chest for the most part, and her shoulders to face is completly unimpeded by anything else. So SuperChick gonna be big in WB merchandising then too? Poor Wonder Woman! I’ve always loved the classic Blue Devil look. I so wish they’d bring this back (though with him being a real demon now, not sure how they’d do that.) I’m not really a fan of his current look, shorter horns, t-shirt, etc. BUT at least he’s not dead any longer! I should just celebrate that fact! I gotta agree with Nathan, above.. it’s a cool image, but it does make explicit the fact that Wonder Woman is no longer one of the “trinity” at DC.